It started with a free T-shirt and ended with a foreshadowing of the volleyball team’s future. Three comebacks in two days, all of them right before my eyes and in favor of the Bradley Braves. It was any sports fan’s dream come true, and thankfully, in my waning days as a sports writer, last weekend came before it was too late. First, before a mild crowd at Carver Arena the Braves matched the mood of the crowd and played lifelessly against Illinois-Chicago. The men’s basketball team made three buckets out of 17 tries in the first half. Without the aid of its strong free-throw shooting in the first half (12-of-17), this comeback wouldn’t have come to life. Bradley was down by eight at the half and on pace to score only 40 points in the game. 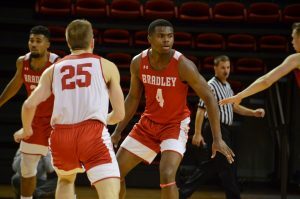 With senior David Collins on the bench in foul trouble, the Braves needed to find their leaders. And then juniors Dodie Dunson and Chris Roberts snapped the team out of its funk. The team came out of the intermission as a new squad, one with passion in its eyes and eagerness to avenge last year’s loss to the Flames. While the team’s defense was picking up the pace, which helped the offense, Roberts made a jaw-dropping play to give a justified climax to the game. Sophomore Sam Maniscalco threw up a three-ball but bricked on it. The ball bounced gingerly off the rim and Roberts ascended over the Flames to throw down a thunderous put-back slam that sent the crowd into a frenzy. Who knew a player who has never played a Div. I basketball minute would be the one to seal a victory for women’s basketball? 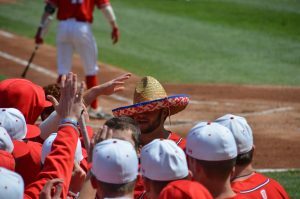 Bradley started off the game 8-1 and looked poised for a blowout against Loyola-Chicago. But like their male counterparts, the Braves got sloppy. Twenty-two turnovers by Bradley and 27 total free-throw attempts in the first half made this game crawl. After a half hour of real time elapsed, only eight minutes had run off the clock. The turnovers gave Loyola-Chicago a 12-point lead going into the half. After catching my second T-shirt of the weekend, my spirits were lifted, and coincidentally the Braves’ were too. Freshman Michelle Lund capped off the 12-point comeback with a three-point basket putting the Braves atop for good. This game also taught me one very important thing – our ladies will be good this year, and they are solid around nine deep, eat your heart out Pat Summit. After the game, my cohort Alex Mayster won a women’s basketball for making a free-throw. The prior games I was not covering for the newspaper, so I could cheer as much as I wanted. But reporting on Saturday night’s victory in volleyball was the most excited I have been in a while. First of all, the Braves were playing the Missouri State Bears, a school I still don’t forgive for changing its name from Southwest Missouri State. The name change was my sole reason for never applying there. 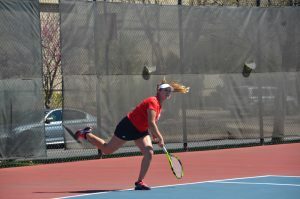 The Bears looked to mop up the floor with the Braves for this match. Their warm-ups left my jaw gaping open and the first set was a dominating performance by the Bears, 25-14. Then as “You Ain’t Seen Nothing Yet” by BTO came on, Bradley picked up the pace. The Dejean twins were digging everything spiked at them, permitting the ball got through a rejuvenated blocking system up front. Sam Black led the team on her senior night with a career-best nine kills in the midst of setting every ball perfectly to her teammates. It seemed as if the behemoth on the Bears, number 21, didn’t exist anymore and she decided to go into hibernation a month early. Every set was a battle, but coach Sean Burdette’s philosophy the whole season of never giving up bled through the team’s shirts. There were battles lasting 30 seconds to a minute, which is long in volleyball terms, and each time Bradley seemed to come out on top. In every set the teams fought back and forth with ties and lead changes. Once the scores got into the 20s, I couldn’t contain myself and stood up to cheer. It was a great feeling. It was the first time the team won before a sparked audience in the Markin Family Student Recreation Center and the first time I saw them win. The losses this season were worth it to see Missouri State team go down in flames. This game also showed me one thing – this program has made huge strides even though their record may not show it. Burdette has done a good job making this team believe in itself and making the sport fun again. I didn’t think the sports year could quite possibly get any better for me (New York Giants, Tampa Bay, triple overtime in the Stanley Cup, “Peg-leg” Woods in the U.S. Open, the Celtics comeback, Kansas over Memphis, etc … ) but seeing a comeback three times in 48 hours live is the perfect cap to a perfect sports year. Direct questions, comments and other responses to dtate@mail.bradley.edu.